Despite half the Shire involved in sporting Grand Finals, Saturday 29th August saw the Jerdacuttup hall filled to almost capacity with tables of eager audience there to see the talented Damian Callinan perform the Lost WW1 Diary, a one man show created and performed by Callinan, and directed by Tim Overton. They were not disappointed! The Ravensthorpe Regional Arts Council (RRAC) presented this touring Country Arts WA and Act-Belong-Commit show in collaboration with the Jerdacuttup Community Association; responsible for setting up and catering for the night. The hall was decked out superbly in camouflaged themed table cloths, camouflage nets, saddles, oils slicks and even a beautiful old rocking horse (although not so tiny and no emu feather in sight; it fitted the theme of the night beautifully!) The JCA also provided delicious gourmet platters to be enjoyed as well as running the bar prior to the show and a spread of deadly cake and slices for supper. 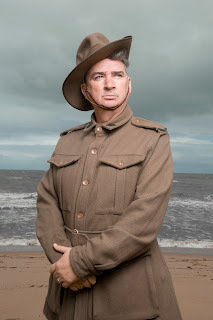 Damian took everyone on a journey of hilarity and tears as he acted out the diary of digger “Paddy Callinan” through his adventures, and misadventures of the First WW. We met delightful larrikins and laughed at their antics and broke our hearts at their losses. Playful banter with the audience peppered the story -who knew that our own “Ken Nomiddlename Norman” himself was part of the seventh? We won’t say why he was sent home in disgrace…Or that we had a fine pair of twin Welsh whales residing in Jerdacuttup? Callinan switched from character to character in the blink of an eye and portrayed each hilarious scene with limited props and amazing realism. He also demonstrated a fantastic memory and a bit of prior homework by injecting some local history and activity into the storyline. Thank you to the volunteers of both the Ravensthorpe Regionals Arts Council and Jerdacuttup Community Association for working hard to make this a night to remember, to bus drivers Kerry and Ian Dickinsen for filling in last minute and our usual driver Robert Bawden for taking everyone out to the hall and getting them home safely. The RRAC would not be able to provide free buses for events without the funding from Lotterywest WA. As our last show of the year, RRAC would also like to thank the ongoing support of the Shire of Ravensthorpe, Country Arts WA and the Department of Culture and the Arts; without whom we would not be able to provide our community with such a diverse annual artistic program. Platters by JCA were delicious! Ross Beckett, Chairperson of the Country Arts WA Board of Directors, brought his family along...all the way from Esperance! Tour Manager, Therese Mavros, introduces the show. After the show, Damian mingles with the audience as we all enjoy some supper. On Friday August 14, a small but enthusiastic team of creative writers attended the Outback Writer’s Workshop with Fleur McDonald, held at the Ravensthorpe CRC. Fleur’s seminar and workshop was professionally presented and extremely informative. The participants enjoyed creative writing exercises and were privy to stacks of information about the absolute do’s and don’ts of pitching a manuscript to the big Australian publishers, along with plenty of the tips for the mass market. With six best-selling novels under her belt, and a seventh getting ready to fly from her keyboard, Fleur was truly inspiring. Having been one of the very first rural literature sensations picked up by Australian publishing giant, Allen & Unwin in 2009 with her debut novel, Red Dust, she’s been knocking out a tremendous read ever since. Some of her titles have been translated into other languages and she’s now emerging as a great Australian writer on the American market. Fleur also had her books available for sale which were quickly purchased, and offered book signings throughout the day. We were very grateful Fleur made the trip to Ravensthorpe to share her valuable knowledge with us; to RedbackOz.com for organising the workshop; the Ravensthorpe Regional Arts Council for generously providing some funding and the Ravensthorpe CRC for ensuring the day ran smoothly. Photo: Searching for a story. Damian Callinan in The Lost WW1 Diary. Free Lotterywest funded buses depart both Ravensthorpe CRC and Hopetoun CRC car parks at 6pm. Please book bus when purchasing tickets. Tickets now available from Ravensthorpe CRC( 9838 1340 for credit card) and Hopetoun CRC. Its a long way to Tipperary without a GPS! After discovering a WW1 diary in a country op shop, Callinan leads the audience into its pages where we meet hilarious but believable characters. The story goes from rollicking farce to aching pathos in a heart-beat.